Penn has managed an impressive achievement that qualifies as a great American film. 148 min. Paramount Vantage. Director: Sean Penn. Cast: Emile Hirsch, Marcia Gay Harden, William Hurt, Hal Holbrook, Catherine Keener. religious quality to Penn's pilgrimage comes through the film as it travels to the places McCandless travelled, places made holy by their natural beauty and the part they played in a young man's purity of intent and his tragic end. Enhanced by the storytelling of Jon Krakauer and now Sean Penn, the countercultural tale of Into the Wild has some of the same poetry to it as On the Road or The Motorcycle Diaries. The film is full of verbal poetry (and prose), that of Jack London, Thoreau, Sharon Olds, and McCandless himself, in words taken from his diaries. The film also benefits from the narration of Chris' sympathetic sister Carine (Jena Malone) and the musical narration of Eddie Vedder, who wrote nine songs for the film. Penn also finds a visual language in his absorption of each natural setting; in this task, he has an invaluable ally in the keen-eyed Eric Gautier, who not so coincidentally shot Walter Salles' film of The Motorcycle Diaries. Each vista is a crucial step in the film's journey, a masterful montage designed by screenwriter Penn and editor Jay Cassidy. Though the plot begins close to the end and alternatingly returns to the final months of McCandless' journey, it also traces the path in an otherwise chronological fashion through chapters detailing the two years of post-university rambling that lead McCandless, in 1992, to an abandoned "magic bus" in the Alaskan wilderness. In the ashes of his national and state identification cards, the self-styled rebel re-christens himself "Alexander Supertramp," describing himself as "An extremist. An aesthetic voyager whose home is the road." Anti-materialistic and anti-war (we see Alex take in Bush's Gulf War announcement while waylaid at the U.S.-Mexico border), Alex talks of "the spiritual revolution," quotes Thoreau's exhortation "...give me truth...", and instructs, "The core of man's spirit comes from new experiences." Putting his body where his mouth is, Alex conquers his fear of water, first with a swim in the sea and then by kayaking down rapids. He rides the rails, works at a grain elevator in South Dakota, and tramps through Arizona and California, including the fabled squatter's paradise Slab City. He's a particularly sad sight in the city, never more out-of-place than when he finds himself amongst the skyscrapers of Los Angeles. At each stop, Alex meets folks who take a shine to his open heartedness and unwavering mission to go north to Alaska and brave the elements: grain farmer Wayne (Vince Vaughn), Danish tourists Mads and Sonja (Thure Lindhardt and Signe Egholm Olsen), teen balladeer Tracy (Kristen Stewart), retired veteran and widower Ron Franz (Hal Holbrook), and fellow tramps Rainey (fine first-time actor Brian Dierker) and Jan (Catherine Keener). Jan tells Alex, who habitually complains about his parents, "You look like a loved kid: be fair." Walt (William Hurt) and Billie (Marcia Gay Harden) McCandless flirted with alcoholism and divorce, scarring their children and deepening an understanding gap between über-successful suburbanites and their wanderlust-driven son. As "Alex" goes on a journey of self-satisfying freedom, his parents agonize and grow closer to each other (and, in a way, their son) than they have ever been. Holbrook's outstanding work won him an Oscar nomination, but it's Hirsch who gives the performance of a lifetime. Aside from having shed 41 pounds (156 to 115 pounds) to demonstrate McCandless' starvation on the road, Hirsch captures McCandless' bliss, his despair, and his ultimate peace. McCandless can certainly be described as naive, foolish, and even selfish, but by reaching into his soul and that of the places he visited, Penn has managed an impressive achievement that qualifies as a great American film. 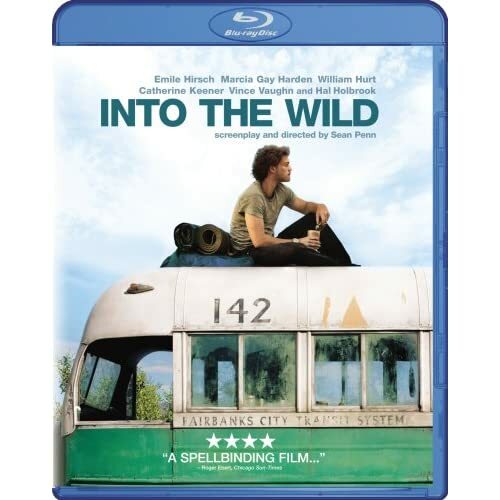 Paramount has delivered a gorgeous transfer for Into the Wild on Blu-ray: hi-def loves the great outdoors, and nearly all of Into the Wild takes place there. Only in the final pull-back shot did I notice a hint of digital artifacting in this 148-minute film. Otherwise, it's all beautiful color and fine detail, taken from a pristine source. The Dolby TrueHD 5.1 surround track is equally impressive, creating a subtly effective immersion into the film's varied natural settings. The bonus features are limited to two informative featurettes produced and directed by Laurent Bouzereau. The first, "Into the Wild: The Story, The Characters" (21:54, SD), deals with the book's journey to the screen, Penn's approach, the actors and their roles. Participants include Sean Penn, Jon Krakauer, Emile Hirsch, Hal Holbrook, Eddie Vedder, Marcia Gay Harden, William Hurt, Jena Malone, and Kristen Stewart. 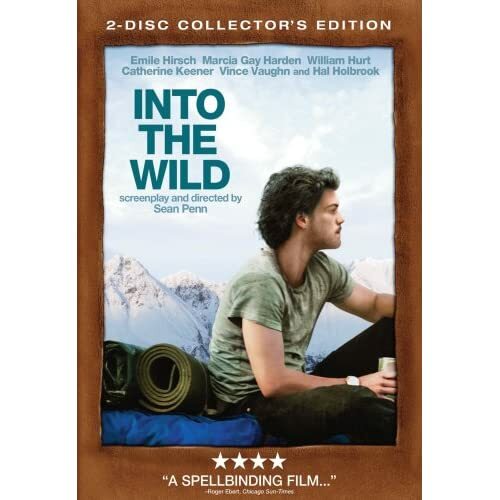 "Into the Wild: The Experience" (17:20) focuses on the dedication required of cast and crew, and the particular contributions key crew made to the film's visual and aural elements. Hirsch, Penn, Holbrook, Vedder, Krakauer, Catherine Keener, producer Bill Pohlad, production designer Derek Hill, art director Domenic Silvestri, costume designer Mary Claire Hannan, production sound mixer Edward Tise, editor Jay Cassidy, and producer Art Linson comment. Last up is the "Theatrical Trailer" (2:35, HD). This is one of the finest Hollywood films in recent years: on Blu-ray, it's especially impressive. All site content © 2000-2019 Peter Canavese. Page generated at 04/18/2019 02:39:36AM.